A Public Relationship officer who doesn’t really understand public relationships lost her job over racist tweets. It was quite easy for her to lose her job all she had to do was tweet some really racist tweets about Aids in Africa. She added that she was ashamed “for being insensitive” about Aids. IAC issued a statement on Saturday evening saying that the company and Ms Sacco had “parted ways”. People were so made about her tweet that they were virtually tacking her using the Twitter hash tag #HasJustineLandedYet. Ms Sacco posted her tweet when she boarded the 11-hour flight to South Africa. 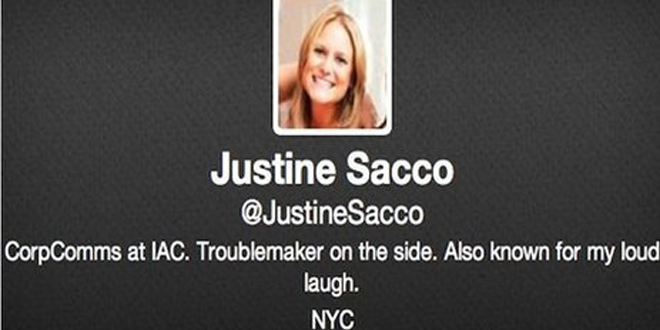 She was on the plane as the storm about the tweet gathered pace, with the hashtags #JustineSacco and #HasJustineLandedYet trending on twitter and fake accounts being created in her name. She has now sent a statement to ABC News in the US – and reportedly to South African newspaper The Star as well – saying of South Africa: “This is my father’s country, and I was born here. I cherish my ties to South Africa and my frequent visits, but I am in anguish knowing that my remarks have caused pain to so many people here; my family, friends and fellow South Africans. “I am very sorry for the pain I caused,” she added. It said there was “no excuse for the hateful statements that have been made”. Where to Shop this Thanksgiving?